This elegant "Key to My Heart" Victorian Style Bottle Opener makes a unique and elegant favor. Made of high quality chrome, the silver opener is shaped like an antique key. 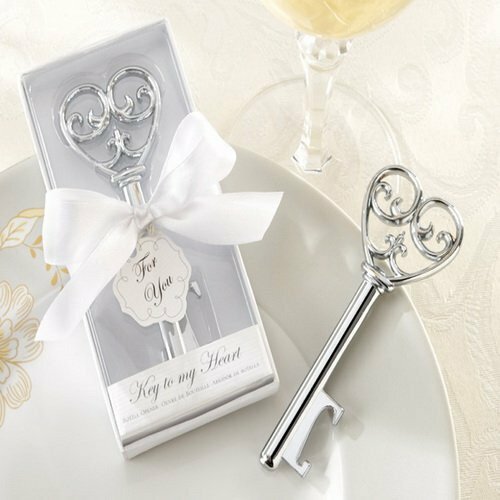 Each opener is presented in a classy white gift box with a clear top with the words "Key to My Heart" below. The favor is complete with a satin ribbon and a designer hang tag that reads "For You." Measures: Width 12.5 cm, Length 5.5 cm, Height 2 cm. These were lovely favors for my housewarming party. Very apt for the occasion and also functional for my guests as they can use it in their kitchens.